Spicy chocolate cookies aren’t for everyone…like small children. 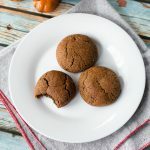 If you don’t want to share with them or would like to teach your kids to keep their hands out of the cookie jar, these Chile mocha chocolate chip cookies are the way to go. If you’re a Starbucks lover, you probably have heard of the Chile Mocha latte, from which these cookies are the namesake. I am a fan of the frappuccino myself. Maybe the word fan is an understatement. My household should honestly take a look into investing in SB stock. I’m probably keeping the business afloat. I would like to think of these cookies like a spicy cousin of the traditional snickerdoodle cookie. These are rolled into balls and then rolled in spices before baking. Even though we’re trying to keep our kids out of our cookie stash, that doesn’t mean they can’t help to make them. They’re fully capable of rolling the dough into balls. Put them to work, just don’t let them roll the cookies in the spices. Chili powder and cayenne tend to burn wee eyes when they rubbed after beginning to cry as a result of witnessing one’s parents consume all the cookies. Spicy chocolate cookies are great for gift giving or for everyday dipping in coffee…or midnight snacks. I’ll have to try left using leftover cookies (is that a thing?) as a pie crust instead of graham crackers. I think I already know what my next recipe is going to be. If you get to it before me, let me know how the crust turns out! BTW, if you’re digging the gray and red napkin in the pictures (which matches Twisted Tastes so well), it can find it at http://www.beautifulingredient.com, along with other eco-friendly handmade products. Check them out! If you like this dessert consider one of these other ones below too! Cocoa, cinnamon, cayenne, and chili spices come together forming the perfectly sweet dessert with a spicy kick. Pairs well with coffee, especially the Chile Mocha from Starbucks. In the mixing bowl combine the butter, vanilla, and 1 cup brown sugar. Beat on medium speed until fully combined and creamy. In a separate bowl, combine the dry ingredients: flour, cocoa, baking soda, 1 1/2 teaspoons chili powder, 1 tsp cinnamon, and 1/2 teaspoon salt. Mix together using a whisk. Slowly add in the dry ingredients and eggs alternating between the two. Mix on low speed until fulling incorporated (about 1-2 minutes). Fold in the bittersweet chocolate chips. Refrigerate the cookie dough for 15 minutes to overnight. When ready to bake, preheat the oven to 350 degrees Fahrenheit. Line a baking sheet with parchment or foil. In a small bowl combine the seasoning: 3/4 cup brown sugar, 1 tbsp chili powder, 1 1/2 tsp paprika, 1 tsp cayenne pepper, 1 tbsp cinnamon. Set aside. Roll 1 inch balls of dough and then roll the balls in the bowl with the seasoning. Place season-covered balls of cookie dough on the baking sheet leaving about 2 inches of space in between. Bake for 15 minutes in the preheated oven. When done, place the cookies on a rack to cool. Repeat until out of cookie dough or save it for another day. Serve with milk or coffee, and no warning of the spice. A little humor in the kitchen is good for the soul. There will be left over seasoning after rolling the cookies. Save it for your coffee in the a.m. or maybe…rub it on a pork loin. It’s versatile.